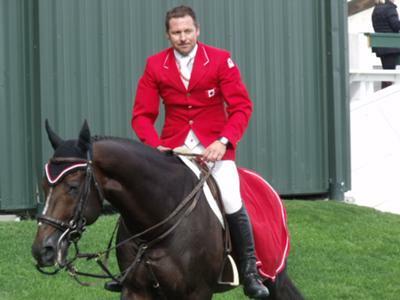 Eric Lamaze & Hickstead after a clear round at the Masters tournament at Spruce Meadows! The clatter of Blinker's horse shoes on the cement behind me was faint compared to the sound of my pounding heart beating in my chest. I could barely hear the jingle of my spurs on my boots as I lead Blinker, my 16.2hh Thoroughbred mare, down the aisle of my stable. As we walked past the boxes each horse popped they're head out as if Blinker and I were royalty. I had to force myself to stand upright by bracing myself on Blinkers neck, which was working well since she was ready to go and was walking slightly ahead of me. I was lucky to have a horse like her, I may be the most nervous person in the world right now and she knows that, but she's not going to let it affect her. She's going to do her very best and carry me through this round of oxers, verticles, and maybe the odd liverpool clear and fast. I just know it. I took a quick glance over my shoulder and saw an empty aisle behind me. Where could everyone be? The stable is usually pretty loud with the hustle and bustle of everyone getting they're horses groomed, mucking out stalls, loading horses, and basically just preparing for show season. Blinker whinnied as we had reached the end of the stable aisle. Ahead of us I saw everyone, the workers, my coach Andrea, my parents, siblings, other riders, and my friends all gathered around the jumping ring. Sadly, that's where Blinker and I were headed. Suddenly, I got even more nervous. I'm never nervous when I go riding, I'm a confident and accomplished show jumper and rider. The only time I'm nervous is if something's going to go wrong. I pushed all those negative thought's aside as I pulled myself atop Blinker. She flicked her black ears back and forth showing that she was ready. I gathered my leather reins in my shaky hands and brought my body into correct position. I could draw a perfectly straight imaginary line down my shoulders to my heels. I clucked to Blinker and she moved forward into a smooth walk towards the ring where I met up with Andrea. "It's alright to be nervous ; there are a lot of people here today that want you to do well. But forget about them, you'll do great! Your more than ready for the show next weekend." She gave me a pat on the back and whispered, "Atta girl Lilly!" That was her 'punchline'. I squeezed Blinker's sparkling white sides with my heels and she brought herself into a powerful trot. I posted to her movements for a couple laps around the ring, letting her get a good look at the jumps. I brought her into a rocking canter and switched our direction. I could hear people murmuring in the background and lost my focus for the slightest second and Blinker fell back into a trot. Cursing myself under my breath I reminded myself not to lose focus. Gathering Blinker into a walk I nodded to Andrea, and then started our course with a slow canter around the ring. I gave Blinker a sharp nudge with my heels heading into the first jump; a four foot vertical. She immediately lengthened her stride and gathered herself to soar over the jump. I tightened the inside rein bringing her to a square oxer. Her hooves contacted the ground on the other side with the jump still fully intact. It was almost as if Blinker had wings. She listened to my every cue and soared over every jump. I felt extremely confident we could finish this course clear and under the time limit. All my nerves were gone. I smiled to myself as I pulled on the left rein towards the three jump combination. We were four strides from the first of the three when my smile faded and everything went blurry. My legs trembled from my nerves. Blinker's hooves pounded faster and faster until she was in a full gallop. I tried pulling her up but she wasn't slowing. I realized she was responding to my legs that were squeezing against her sides to keep them from shaking. I tried to relax my legs but it was too late. Blinker propelled herself up over the jump with me one step behind. I ended up catching the bit in her mouth to keep myself from falling but I made her lose balance. Her polished front hooves clipped the top rail and Blinker's hind legs caught it as we went down. I lost my seat and fell forward onto her neck as we landed. Blinker took off at a thundering gallop and she bolted towards the next jump which came way too soon. Blinker took off too late knocking down all the rails as we ascended and all the while I was hanging onto her neck. I tried to pull her in a circle but she'd chomped down on the bit in fright and wasn't slowing or stopping. The final jumped loomed ahead and was coming all too quickly. I didn't think she would attempt to jump this one but I was instantly corrected as she tried to jump too early but ended up skidding and throwing her hind legs up violently and tossing me over her head as she flipped over on top of me. I was able to roll out of the way before she crashed on top of the rails of the jump... and me. Blinker rolled to her side to try and get up. I tried to stand and make my way over to the thrashing horse but a horrendous pain in my arm stopped me as I fell to the ground. It was then that everything went black and the only noise I heard was my heart beating. My bruised arms rested on the white rails of Blinkers paddock as I watched her peacefully graze. On a normal day I would`ve had a lead shank in my hands to bring her in for a morning training session, but that`d be a normal day 3 weeks ago. I heard footsteps approaching me from behind. Let me guess: Andrea? "Good morning Lilly!" Andrea spoke in a cheerful tone. "Mornin'," I had less enthusiasm than a turtle. "Ahh someone's in a good mood I see,"
"Clearly you see nothing." I snapped turning around to face her. Her smile faded. "Watch it young lady. Now go bring that hoss' of yours and lets go for a long hack together and build her stamina back up for the show this weekend." She ordered. "I'm not going. I've told you this a million times Andrea! I'm never competing again! Or riding." I turned back around to see Blinker approaching the fence to see the action. "You've already missed four shows! I'm tired of this Lilly! You haven't even rode since the accident! This isn't like you!" Andrea ranted on. "The REAL Lilly I know wouldn't quit on her horse just because of a sprained arm! Clearly it's fine now since you've been lifting buckets of horse feed and muckin' stalls!" "You cannot tell me I'm fine." I had my teeth clenched so tight together to keep me from saying anything more that it burned. "You are right. I can't... because I quit. 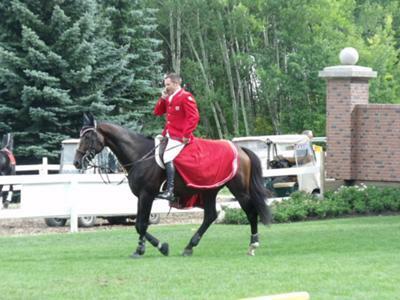 Ring me up if you ever wanna be somebody in the world of show jumping." Andrea showed no emotion on her face but I knew she was dying inside. "Sure." That was the last word I heard Andrea say for nearly a month. It killed me inside to be on the other side of the jumping arena; watching. I had to 'rent' my horse out to other girls at the stable so Blinker wouldn't lose her muscle and become overweight. All of the girls were incompetent and didn't know how to properly ride MY horse. Most of them rode her once, paid me the twenty bucks and never came back. I sat on the rails of Blinkers paddock at dawn like I do everyday and watched her gallop freely around the perimeter. I wished more than anything that I was on her back feeling the wind flow through my long blonde hair. Blinker halted with a sliding stop and turned to face me. Her crisp brown eyes seemed to have peered into my soul and made me realize what I had to do. I reached my hand down to my Wrangler jean pocket and pulled out my cell phone. I flipped through my contacts until I found Andrea's number. I gingerly pressed the green 'call' button and pressed the phone to my ear. "Hi. Umm sorry, who is this?" It wasn't Andrea. "This is Soraya." She answered in a tone that I didn't like at all, she sounded stuck up and rude. "Oh OK. Is Andrea there?" I asked. "Well where is she? This is her phone number. I need to talk to her." "She's adding more height to my jumps. I'm a show jumper ya know. I'm competing this weekend. Andrea's my coach. Who are you anyways and what do you want?" "Coach?" I could barely speak the inevitable truth. "Yes! Now what do you w-" I couldn't hear any more and hung up. Three hours later after it had all finally sunk in that Andrea had moved on I decided I would cowgirl up and get her back, and once again I picked up my phone and dialed her number. "Ya! Andrea, I'm so glad I got a hold of you!" "Have you decided your going ride again?" She asked. "So I'll see you at the show on Saturday?" "Aren't you gonna coach me for it?" "I can't, I have a new client hat I'm training." "O-" I have a bad habit of hanging up on people when I'm disappointed. I ran down to the stables and grabbed Blinker's bright pink lead shank to bring her in for a practice session. After I was done tacking her up I brought her out to the jumping ring and put my foot in the stirrup but something inside stopped me. I couldn't do it. I can't. Blinker anxiously flicked her ears back and forth. I cautiously slid my boot out of the stirrup. My legs trembled with fear as I led Blinker back up to the stable to un-tack her. The same thing happened everyday and everyday Andrea called and asked how my training was coming along and everyday I told her "Great!". Saturday quickly approached and the morning of I was busy plaiting Blinker's mane and tail to keep myself from getting even more nervous than what I was. I slowly loaded Blinker into the horse trailer and drove down to the show grounds where karma would meet up with me. "Andrea!" Andrea spun on her heels and made her way back over to Soraya. I was contestant number 16, and my turn was coming soon. I knew that I had to get on. Blinker danced eagerly at the end of the reins as I led her over to the warm up ring where I would ride for the first time in over a month. I pulled the reins over Blinker's head and gathered them at the pommel. I then slid my boot into the stirrup. "One." I counted the bounces before I would pull myself up. "Two, three!" I jumped up at the third count. I was on! I put my other foot in the stirrup and positioned myself correctly. I posted in rhythm with Blinker's eager trot with a wide grin on my face. "Contestant number 16. Lilly Roome and Blink Of Lighting please enter the ring." The announcer called. I made my way over to the ring and entered making a circle at a canter before heading to the first jump. The course was identical to the one Blinker and I had the accident with. I cued Blinker over every jump perfectly and we were going clear so far. Then the last three jumps came. The combination. I felt Blinker tense beneath me as I leaned forward into the two-point position as she gathered herself over the first one. We landed! I sat back slightly slowing her for the two strides we had to do before the next one. Blinker jumped easily over it with no rails knocked. I gave her a quick nudge with my heels the second we landed and she thundered to the next and last jump. Once again, she gathered herself up and I felt her front forelegs spring over the jump. We had jumped a clear round! I gave her a proud pat on her shoulder as we trotted out of the rings. I was the only one to jump clear that day makingme the automatic winner. I guided Blinker back into the ring to accept the first place trophy. As we left the ring caught glimpse of Soraya screaming at Andrea and I was able to hear the words "I quit" come out of Andrea's mouth. Andrea made her way over to Blinker and I who were getting our pictures taken for the local newspaper. Andrea smiled and nodded. "Atta girl Lilly!"